Got some Creative speakers today to add to the setup so I fished out my Sony Mavica to get a pic while it was (relatively) clean. Ignore the tigger cup , its just a nice size for a cup of tea! I will pimp my loverly new L380 tho , this is the nicest laptop i have used in a long time. RIP macbook pro you WONT be missed. zrrion wrote: ↑ Got some Creative speakers today to add to the setup so I fished out my Sony Mavica to get a pic while it was (relatively) clean. I should make a headphone stand sometimes. 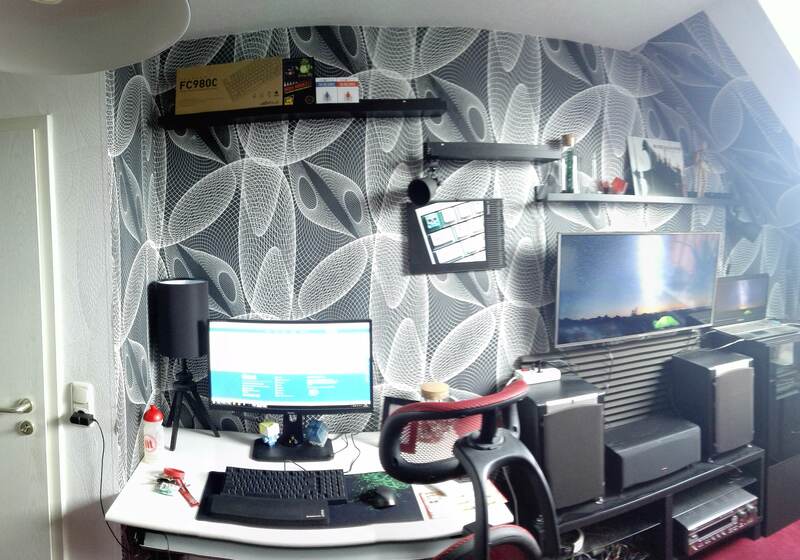 Here´s my humble setup, what do you guys think? 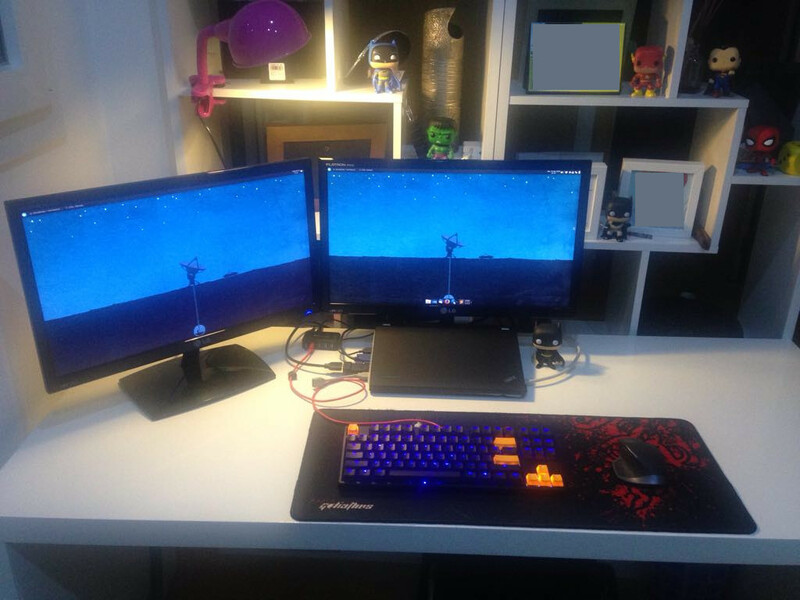 Laptop on the right or below monitor ? 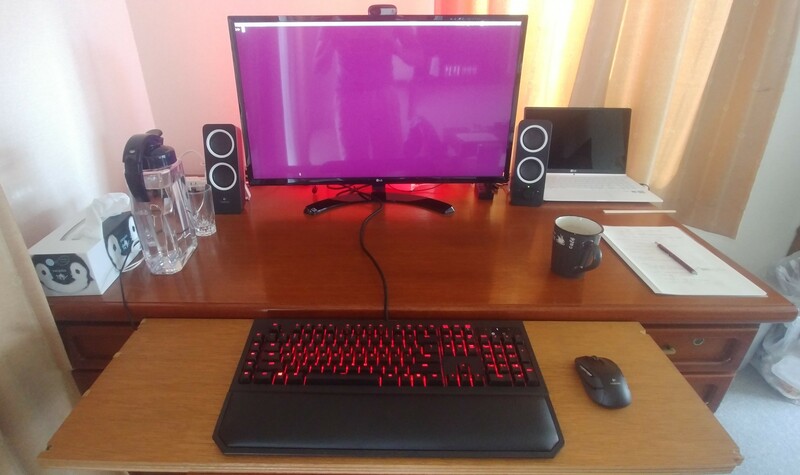 Put a battleship on the desktop, if only for the photo op. Better. What a wonderful sight to behold. Let this be my introduction to the forum. Still amazed about the absolutely practical, minimalist and definitely exquisite design it has. Unbeatable. Can’t resist posting this, finally finished my Zenith/AEG laptop build so this is going to be my desktop for a while now. Now that's a cool restomod. Great job! Scarpia wrote: Can’t resist posting this, finally finished my Zenith/AEG laptop build so this is going to be my desktop for a while now. What switches does this beauty have? It's just Alps integrated dome, I'm afraid. Feels better than a chiclet rubberdome, but it's no Alps SKCM. To be fair on them, the Alps domes in these wee Zeniths are some of the nicest around. 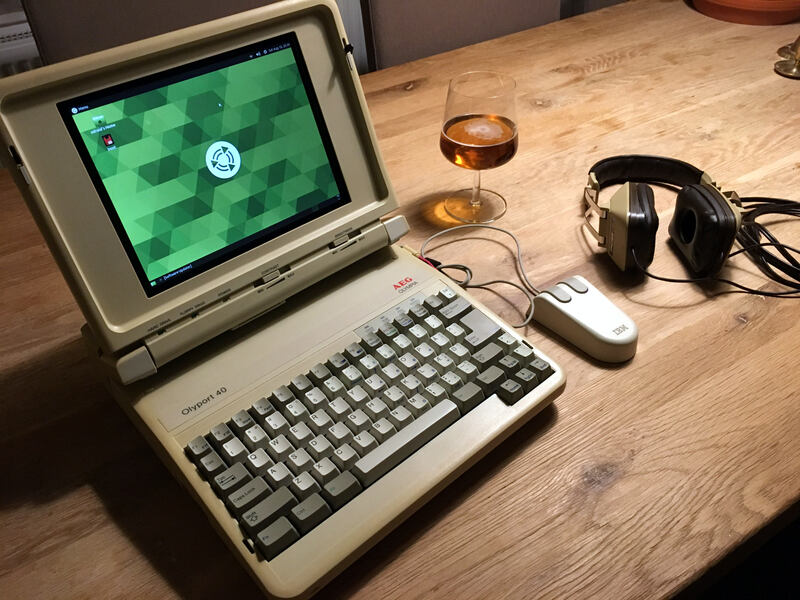 It's not quite Topre, but it's a great step up from most cheapo desktop dome keyboards, let alone the domes in laptops of its vintage (or now). I don't think I had ever seen a multimonitor setup where all the screens were in vertical. How's it handle? depletedvespene wrote: ↑ I don't think I had ever seen a multimonitor setup where all the screens were in vertical. How's it handle? You mean how it's usable in regular computer work? It's nothing really special. For me, upright monitors limit head turning and mouse travel distances (when compared to landscape). And they are useful for portrait documents (mostly sheet music and technical PDF documents, in my case). I also use the center monitor in landscape orientation frequently. 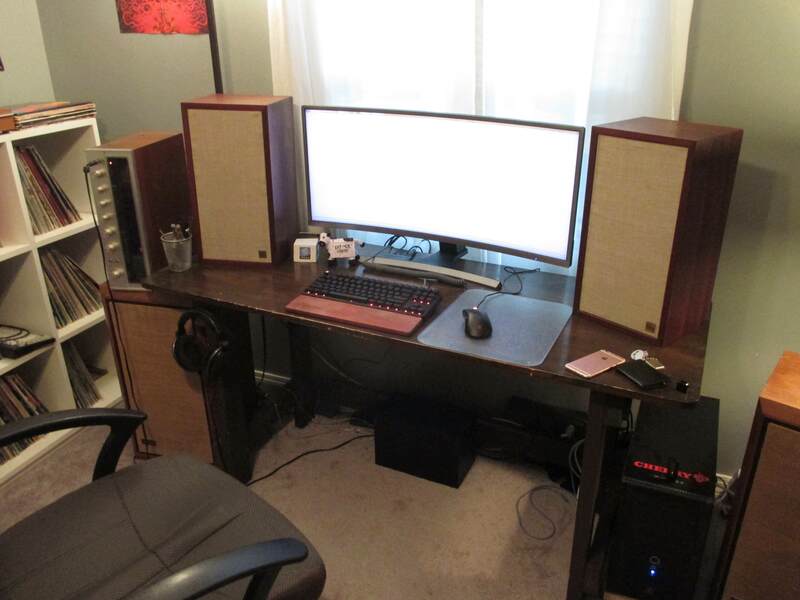 As the standalone monitors are old style 5:4 ones, the upright orientation doesn't look too exaggerated on them. The biggest oddity is that the DPI of the ThinkPad monitor is totally different from the other monitors. Running a Gnome deskop, I didn't find out yet how to scale the monitors so that font sizes etc. match (other than running monitors at non-native resolution, which results in a fuzzy image). 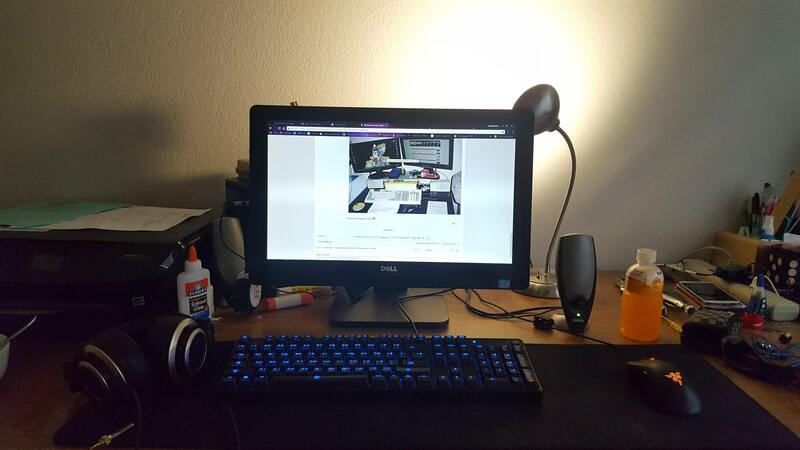 In my own setup, I have two 1920×1080 monitors, one in horizontal and one in vertical — just like you, I have the vertical one for reading documents, but I couldn't have both this way, mostly because of the 16:9 proportion. I kinda wonder if had those two units been 1920×1200, such a setup would be comfortable enough to pull off. I have probably posted this before. I wonder if that could be replaced by a single, curved monitor of the combined size of those three. 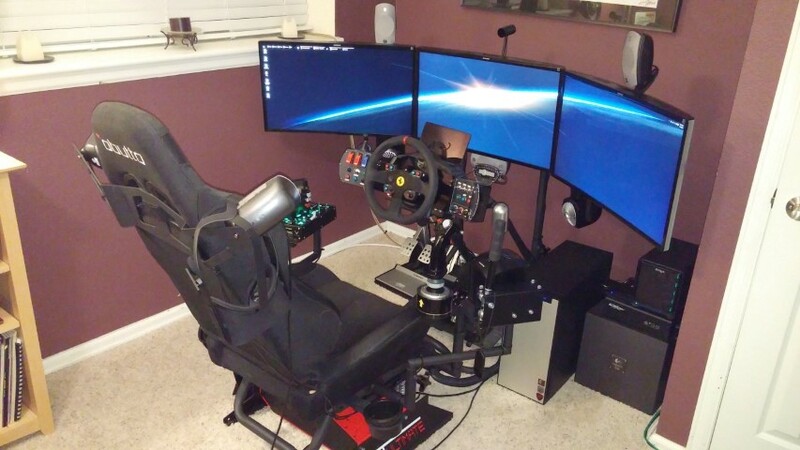 zslane wrote: ↑ I wonder if that could be replaced by a single, curved monitor of the combined size of those three. I wonder if such a beast would cost only the combined cost of those three. 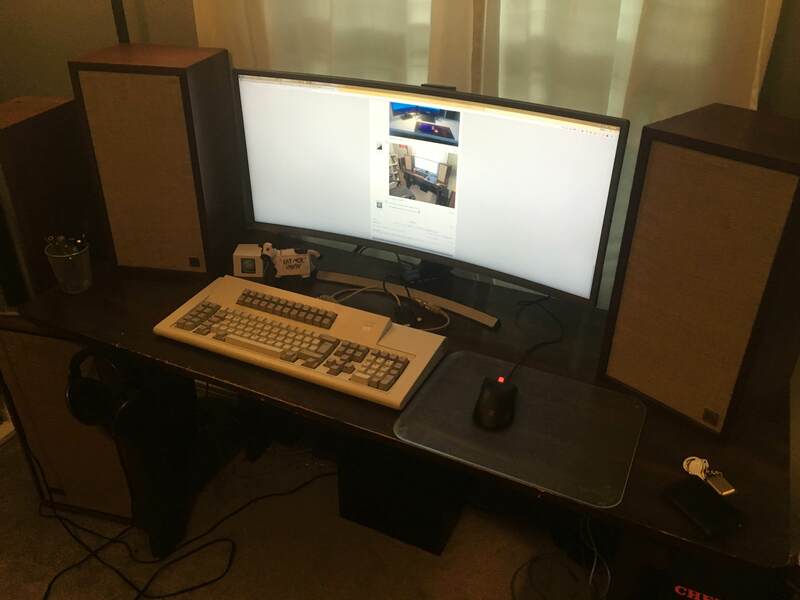 The three monitors provided me a 3600×1600 screen estate and cost me ca. €150 total. I could plug them into a €30 GPU. A single 38" 3840×1600 monitor would cost €1300 here, and it would require a major GPU upgrade. That assortment of white balance reminds of vintage 3D glasses! I’ve a 24 inch 4K Dell that cost a small fraction of that figure. Its pixel pitch is only just enough, seeing as I’m on Retina graphics from the phone on up through iPad to my laptop. A friend has a 27 incher 4K at home and while gaming is fantastic with an Geforce 1080, actually using Windows is pretty painful on it. So I see the need for big old chubby pixels when your platform requires, as well as your wallet. 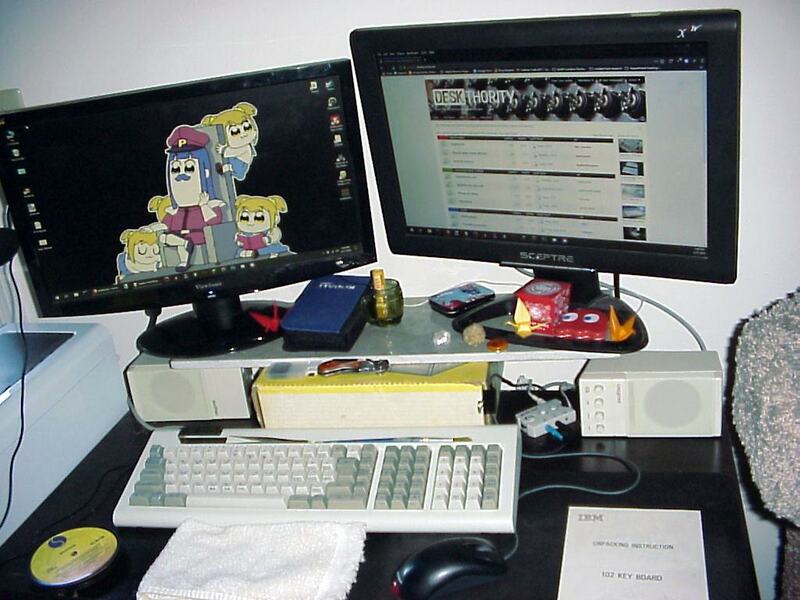 Agreed; all hail multi-monitor setups. Also, curved screens are for wankers. I managed to keep my dual 27 inch monitors from my old job, which offer a very respectable 5120 x 1440 pixels - and I can drive them both from a not-quite-new Macbook Pro. 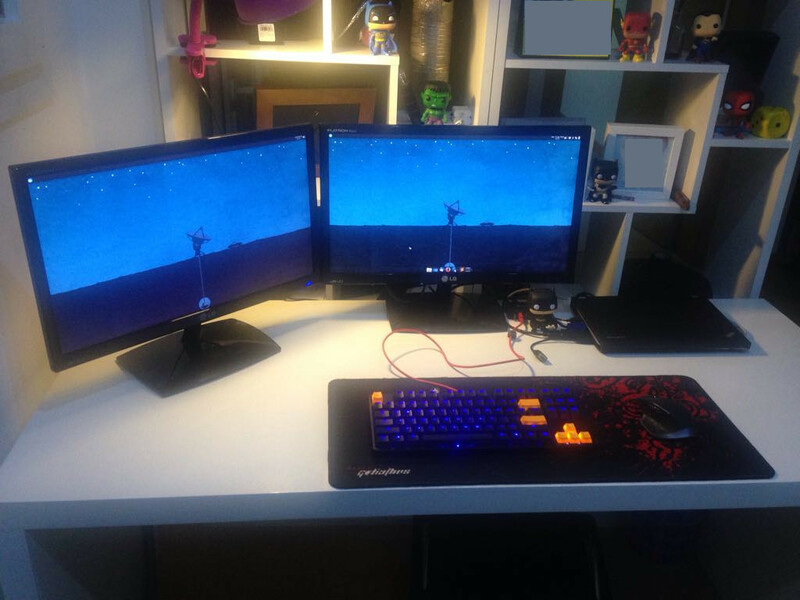 My advice for anyone contemplating what to get: Go for a setup which will give you at least 1440 vertical pixels. 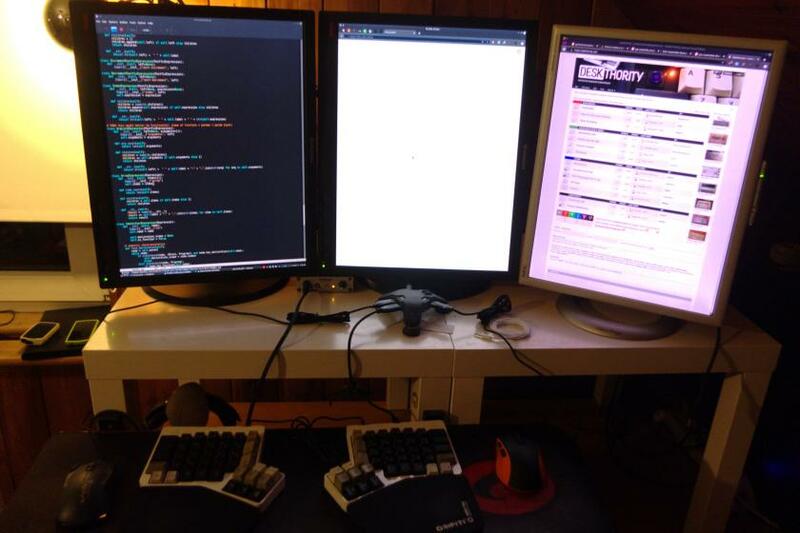 After a certain width (I'd say around 3200 pixels), you reach a point of rapidly diminishing returns for horizontal pixels, since you can already fit three browser windows side by side (or a browser, a coding IDE, and Slack, with a terminal window squeezed in somewhere), and you *will* get tired of turning your head more than that all the time. Vertical space, on the other hand, gets underestimated a lot; at my current work I have a bit less screen real estate on my main two monitors, namely 3840x1080 pixels, and surprisingly I don't miss those extra 1,280 horizontal pixels at all, whereas I am painfully aware of the 360 fewer vertical pixels. Since one massive, curved monitor would probably be prohibitively expensive, I guess I'll just wait for the Occulus to mature a little more. My setup for 2018. I'm currently using the dual Cyrillic/English 3278 I restored earlier this year.